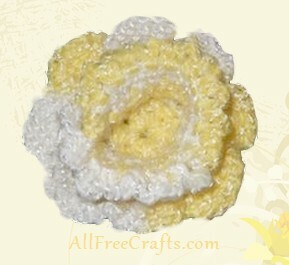 Crochet a bouquet of cheerful daffodils or narcissus – all you need to change the look of each bloom is to change yarns. The trumpet part of the flower stands out quite well, as you can see in the side view photo, below. Try crocheting the trumpet in one color and the petals in another, or use variegated colors, as I did, for a different flower each time. Ch. 3, join to form a ring. Row 1 Ch. 3, 11 dc in ring. Join. Row 2-5 Ch. 3, 1 dc in each dc. Join. Row 6 *Ch. 3, sc in next stitch*. Repeat from * all around. Break yarn. Join yarn between stitches of 2nd round of trumpet and work 30 dc evenly spaced all around. Ch. 3, 2 dc in same space, 3 dc in next space, sc in next 2 stitches. *Cluster of 3 dc in each of next 2 spaces, sc in each of next 2 stitches. * Repeat from * all around.